Joseph Millott Severn was born on May 20th 1860 at number 23 Nottingham Road Codnor. This is the first of the four cottages just below the Alms Houses and before the entrance to Goose Lane. His father was a stockinger from Codnor and his mother a Quaker from Derby. Some of his first memories are from the age of about three years old, when he describes attending a dame’s school at Hockley Yard off Alfreton Road. The young schoolmistress was a Miss Brunt. At about this time in his life, the relationship between his mother and father was starting to deteriorate. His baby sister Lucy had died and his father would frequently resort to drinking heavily. The constant quarrelling and the loss of yet another baby girl when only a few weeks old eventually resulted in his mother leaving home and not returning for three years. During this time he went to live with his uncle William and Aunty Rhoda, firstly at the Searson houses off Codnor Denby Lane, then at Waingroves for about three years. Although his Aunt and Uncle treated him well, he missed his parents and would visit his father every Saturday and return to his uncles Monday morning. Unbeknown to his father he would also have secret meetings with his mother. There would be occasions were he would be awakened in the middle of the night, quickly dressed and wrapped in a shawl, and taken by horse and trap to Matlock or Derby or some other location were his mother would be waiting to see him. They would spend a couple of hours in each other’s company before he had to return to his uncles. His early education was at Jessop Street School, but he hated it and would often play truant, much preferring to go bird nesting in the local fields and woods. He later went to Crosshill School, which he attended regularly. At the age of 10 he worked as a farm boy for Mr Stirland at Hall Farm (now demolished and the site of the French Horn Public House) a year later he started work in the local collieries. He spent three years working down Butterley No. 2 Iron stone pit for twelve hours a day (6am to 6pm) as a pony driver earning six shillings a week. He then spent a further year and a half working down the Forty Horse Coal Pit eventually earning twenty four shillings a week. It was here were he nearly lost his life when a roof collapse knocked him to the floor and completely buried him. He was lucky enough to be able to wriggle free from the debris and escape with only a few cuts and bruises. It was at about the age of fourteen when he started to become interested in the science of Phrenology. This was the study of an individuals personality traits and behaviours, often by “reading the bumps and fissures of the skull. This was an interest he had picked up from his mother who had been taught by Dr. Spencer T Hall of Derby. He also started to regret missing so much of his schooling. This sudden thirst for knowledge resulted in him attending Mr Loriman's Night school at a cost of one penny a night. At the age of seventeen he decided to join the building and joinery trade and became an apprentice to Mr Fowkes, a local builder. He was involved in many building projects around Codnor including the Methodist Chapel on Wright Street and the shop on the corner of Wright street and Jessop Street (now a private residence). He left Codnor when he was twenty to work in London firstly as an apprentice joiner then as a journeyman. (A journeyman is someone who has completed their apprenticeship and now works as a fully qualified employee). In 1889 he married kate Heywood, but after only nine months together,she became seriously ill and died of rapid consumption (tuberculosis). He married his second wife, Alice Maud Thwaites on the 21st October 1890 at Brompton church. They went on to have two sons, Adolphe G. Millott Severn and Donavan M. Millot Severn. Joseph Millot Severn is best know for his contribution to Phrenology, from opening his own surgery in Brighton to becoming president of the British Phrenological Association. Sir Harry Lauder, singer, songwriter and comedian. Sir Arthur Conan Doyle, Author of Sherlock Holmes. He was also able to produce a Phrenological delineation of an individuals character by studying photographs or film footage. One such delineation for King Edward and Queen Alexandra appeared in the July 1902 edition of The Popular Phrenologist Journal. Another for the Duchess of York (later Queen Mary) appeared in the same Publication and was acknowledged by Her Royal Highness in the following statement. "The lady in waiting presents her compliments to Mr Joseph Millot Severn, and is desired by H.R.H. The Duchess of York to thank him very much for the Phrenological and physiognomical sketch which he kindly sent her." At the outbreak of WW2, and at the age of 80 he was asked to provide a delineation of the new prime minister Winston Churchill. Winston Churchill: "His character hinges largely on his large secretiveness. Persons so amply endowed with this faculty need to be careful lest their proneness to conceal brings suspicion on to themselves. It is secretiveness, however that gives self-possession, a very good mental asset when accompanied with a first rate interlect, which Mr Churchill fortunately possesses, and is especially shown in times of danger and emergency. He is not easily perturbed, scared or thrown off his balance. He loves to spring surprises on others, and whilst seemingly letting others have their way, quietly gets his own. He is remarkably adaptable and versatile yet decidedly unconventional,attempts much,and though he may not always score,he has bigness of mind, is prolific of original ideas, shrewd and knowing, a past master in strategic planning, venturesome, with wonderful control of his feelings, and commands confidence. Mentally he is capable of filling many foremost public positions with destinction and ability, the position of prime minister, to which he has recently been elected, provided him at this momentous stage of world-wide martial disturbance with opportunuties for the utilisation of his best gifts. He has a mature understanding, and realises that might must be countered by might. The Nazis realise this, and fear him." Joseph and his brothers, George and Franklin later funded the building of the Almshouses at Codnor, as a lasting memorial to their mother Elizabeth Barrett Severn. 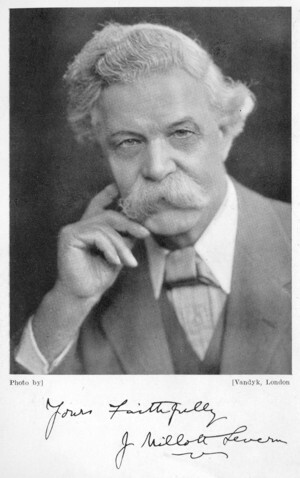 Joseph Millott Severn died at his home in Brighton in September 1942. "The following plans were submitted:- Four Almshouses for Messrs. Severn Bros' Nottingham Road Codnor." This bald announcement in the Heanor Council Survey Committee minutes on Wednesday evening had behind it the fact of a most generous gift to Codnor by one of its oldest families. 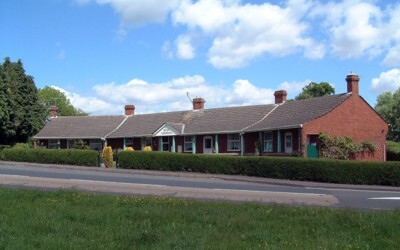 This consists of four compact dwelling-houses, to be erected in the style of bungalows, which will be dedicated to the memory of the donors mother and family and which, when completed will bear the inscription:- "To the memory of Elizabeth Barrett Severn and family"
The idea of the scheme originated with the youngest son, Mr Franklin Severn, of the Market Place, Heanor, and his elder brothers, Prof. J. M. Severn, now of Brighton, and Mr George Severn, Market Place Codnor, readily promised their assistance. Appropriately the site desired was the one adjoining the old homestead of the Severns on Nottingham Road, Codnor. The acquisition of this was made possible by the splendid generosity of the Butterley Co. Ltd., who upon being approached for its purchase , and having ascertained the object, readily gave the site, consisting of half-an-acre of frontage land. Mr H. Eustace Mitton from the outset has taken a keen interest in the project, and in addition to the gift of land, the company have placed the services of their colliery survey department at the disposal of the donors, and done the necessary architectural work. The site of the four houses is conveniently situated on the Nottingham Road within a few yards of Codnor Market Place. The plan shows the houses to be brick built and slated roofs, all the rooms, which are admirably placed on the ground floor. To the front are the living room and bedroom, measuring 12ft by 12ft 5in and 12ft by 9ft respectively. At the rear is the scullery, 11ft by 9ft 7 1/2ins with a spacious box room and coal house and sanitary offices, all of which are combined under the main roof. A continuous verandah along the front of all the houses adds a pleasing affect to the general appearance, and there are both front and back gardens. The houses are intended solely for the use of one family, and throughout the standing impression is that everything is being done to make for happiness and comfort, and to brighten the remaining years of the aged occupants. Seen by a "News" representative regarding the proposed generous gift, Mr Franklin Severn said the project had been contemplated for over five years, and it was anticipated a start on clearing the land would be made almost immediately. Building would probably commence in the early spring of next year, and the houses be ready for occupation before the cold weather set in next year. The Butterley Company had acted most generously. Mr Severn was most emphatic in declaring that the donors would have nothing to do with the letting of the houses. When completed these would be endowed and handed over to an independent board of governors, who would have to be appointed. Fig.1 The Severn Almshouses 2009. Four cottages built in a crescent shape.